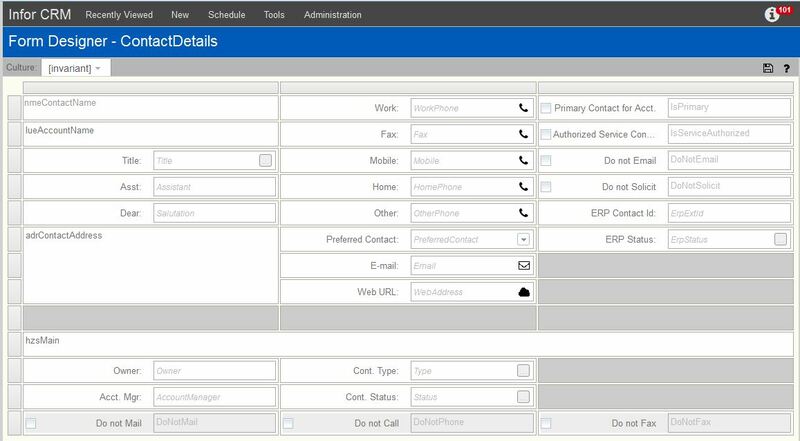 In Infor CRM 8.2, many of the screen layouts can be edited right from within the web interface. This includes adding, hiding, editing labels and such on fields but you cannot delete or remove one from the screens once added. There is a way however, to fill in the white space a hidden field leaves behind. First, go to the last row of fields on the screen and right click to add a new row below. Now drag your hidden fields from above into one of the 3 cells in that new row you created. You can create as many new rows as needed. This makes the previous screen space the hidden field was occupying available to drag another field into. The result is that you will have eliminated the white spaces and made the screen as small vertically as possible which makes for happy users.